An amazing pile of rafter tails created from recycled Douglas Fir. Beautiful recycled Douglas Fir is used for the rafters on this new porch and soon, and just in time as the rainy season begins, Lois will have a dry entry to her home. A day of wood and steel preparation to create the new entry porch. Once again, beautiful recycled wood is being used. Lois has been busy painting the plywood so when looking up, the soffit will be a lovely green. These three newly built buildings make up a small (860 square feet of heated space) home. They are constructed of materials we found or located through Craigslist, ReStore, ReUse Consulting and classified ads. The first picture is of the building affectionately call the barn, which includes space that doubles as office/guest room, laundry and bath. Of the next two buildings, one makes up the kitchen, living, dining and office nook, and the other, accessed by a bridge, is a bedroom, bath and library. 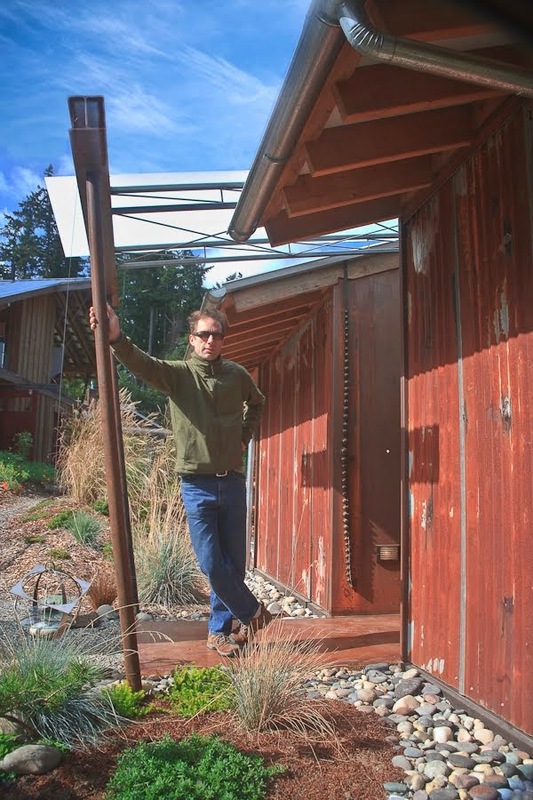 All three buildings have recycled beams, posts, siding, flooring, rafters, bird blocks and even doors constructed with recycled wood. The heating system will rely on solar hot water, with a back up flash unit. Note: The bridge caps are off the bridge. They were taken off for refinishing. We'd initially used a green preservative but it wasn't up to the task. In refinishing we needed to use a less environmentally green product but in the long run it will preserve the wood better and we will need to use it less often. Sometimes the current solution isn't perfect, but products are changing and improving daily so it's important to keep up-to date on the newest products. The end of the line for Brad's old Nissan. He's had this truck for a decade, putting 242,000 miles on it and hauling unbelievably huge loads. It has been named the wonder truck as it has been outstandingly strong and reliable. But, time's up! The wonder truck is too tired to carry the heavy loads Brad needs of a truck. The hope is the wonder truck can be retired to a farm and continue it's useful life carrying light loads. The new truck, a Ford, meets the Nissan in the first photo. Brad proudly shows off his new wheels. More hauling power and space plus better gas mileage, along with more comfort, make the new purchase an outstanding work vehicle. A diesel, 4-wheel drive with rack and storage boxes, plus, in a pinch, the capacity to carry six, will provide versatility and meet almost any job need. The space to pick up and carry found objects for reuse is critical when building with recycled materials. This new truck's work-horse ability will make it more efficient for getting the job done. 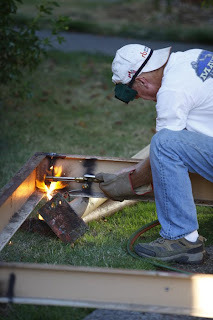 Creating screens from the deconstructed carport scraps. The former carport pieces turn into three screens for patio privacy and garden interest. 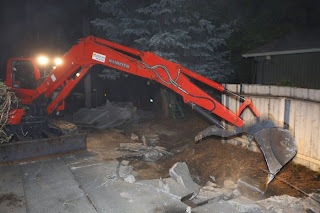 These huge steel sections were pounded about five feet into the ground to terminate the parking place; provide privacy from the sidewalk; and provide a boundary at the property line. The material to be filled in the screen openings is yet to be determined. The materials discussed: wood slats, tightly stretched canvas; recycled steel mesh; or some other material yet to be found, but just waiting for a creative use. Ready for plants? Well, almost ready for plants. Still more soil, earth moving and back filling needed to get all the cracks and crannies just so, but, then, plants. The large boulder on the right hand side is a sitting platform and the large boulder on the left is a climbing rock. Placing the boulders is a many person operation. 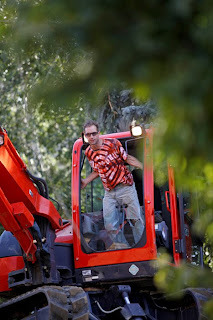 The machine operator needs spotters to direct as to which way to turn, twist, lift or push deeper. It takes a million directions, and many hands, to get the boulders in just the right place and at the right angle and depth. Once the carport is down and removed; the sewer dug up and repaired; it's time for placing the boulders on the side yard for a path/patio/climbing garden. The new sewer line is installed. Notice the separate storm water (gutters) and sewer lines that tie together. Unfortunately Seattle doesn't have storm water systems for many of it's neighborhoods. This means that when it rains, the clean water goes into the sewer, is treated at great expence to the tax payers as sewage, and is then discharged to the Puget Sound. Clean fresh water that wont be absorbed back into the land, that wont support habitat or be used by plants or for cultivation. Essentially gone. The separte lines will allow us to capture the rain water at a later time and put it in a retention pond where it will create aesthetic, habitat and retention, helping to solve the problem Seattle has created. And then, at 14' deep, outside. This makes for quite a first step out the back door! Digging a really big hole! Ripping out the concrete -- late into the night. Off with the carport's head! The carport will be cut into pieces which will be used for screens in the front yard to help hide parking and create privacy. 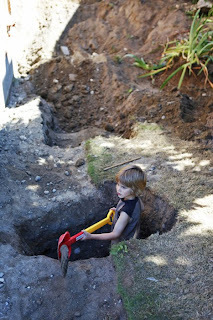 Repairing a sewer can be quite the hole digging exercise. More soon on the full adventure of the past several days. As deconstruction* of interior walls takes place it's interesting to see the spaces opening up. Looking through the newly evolving area into the kitchen/living area with the light flooding down from the sky light is wonderful. One of the "fixes" Lois wanted in this remodel was more light. Now, with walls being removed, the new light from the skylight flows through much of the house. *I use deconstruction rather than demolition because as the materials are removed they are prepared for reuse and, as much as possible, kept out of the dumpster. Sustainability is definitely about thinking of the reuse of materials -- always. Soon, very soon, Lois will be "snug as a bug in a rug" with all this new insulation in her roof. While Brad and Travis work away on the roof, Joe is tearing apart the interior, with an eye to saving as much as possible of the old materials for later reuse.